I work for a startup where we handle just about anything Website/SEO/Social Media related. The biggest share of revenue comes from websites and when it comes to making a modular, customizable website quickly, not much can beat WordPress as a CMS. Obviously some people have disagreements because this is the internet and the day that somebody doesn’t criticize somebody else’s preferences is the day we discover World Peace. This is simply my personal preference when it comes to WordPress development. We started out doing things the old fashioned way. When I started we had a reseller account with HostGator and we had around 20 WordPress sites in various states of disrepair. It soon became clear that HostGator was not cutting it, their server was too slow to make changes quickly and it often took an hour or more to connect to support who, while competent, didn’t have a lot of fixes. Production Server – We needed a solid production server that we could rely on to not go down and maintain 99.99% uptime. Staging Server – We needed a testing environment similar to A2 just to double check that the site works in a live environment. It’s also a good way to show clients progress and get their input. Local Server – We needed a way for us to work on our sites locally without a whole lot of hassle. Move Code Between Servers – We needed this to be fast, simple and easy without FTP. Modern Coding Practices – Duh. Sharing Code – We need to be able to share our code easily and quickly. We upgraded our server to a solid reseller server from A2 Hosting which showed immediate performance improvements. This reseller included WHM which includes cPanel for every client’s site. A lot of people don’t like cPanel for it’s ‘bulkiness’ and they’re totally right. However some clients do need access to make some changes to the way their webserver runs, and so far I haven’t found a good replacement that’s as easy for clients to use. So for now we put up with it. Another important thing that’s required in this server is SSH access, and A2 makes it pretty simple to connect to your sites so you won’t have to worry much about it. A2 also has a pretty great collection of tutorial articles both for their services and server management in general. This one was a little more difficult. We needed an environment similar to A2 however WHM is not free nor cheap. We decided to settle for a simple LAMP server hosted with Linode (Also highly recommend). We also needed replacements for cPanel in case we needed to access the server to debug, so we settled for eXtplorer which provides a file manager similar to cPanel. We also installed phpMyAdmin for database administration. We setup a subdomain for development and put each site into it’s own directory so that it’s easily accessible to clients who want to see progress. Here’s where things get a bit tricky. Since Windows didn’t really suite my new workflow needs I setup a dual boot on my work computer so I can easily switch between Windows and xUbuntu whenever the situation required it. Unfortunately if you’re a Windows user this is probably where you’re going to have to get off, as I don’t know exactly how this would work on a Windows machine. Varying Vagrant Vagrants (VVV) – A WordPress specific Vagrant machine that allows multiple WordPress installations to play nicely on one machine. By default it comes with 3 WordPress blank installations for the Stable, Trunk and Develop branches of WordPress so you can test Themes and Plugins with the newest versions. Variable VVV – Very neat little script from bradp that takes care of the grunt work setting up and taking down sites in VVV. Using Variable VVV you can create new sites or delete old ones on your VVV machine with just one command! With Variable VVV and VVV creating and managing your Local Server is quite easy and simple. This was the issue that stumped me for the longest time. There seemed to be no truly easy way to push the entirety of WordPress, database and all, quickly and easily between the separate servers. There were solutions out there that seemed too complicated and required the knowledge of other languages just to get around. I needed something simple. Wordmove works best with SSH due to it’s use of rsync which makes copying files super duper quick (like anywhere from 5-10 times as fast as FTP) but it can also work using FTP (even including the database!). Basically the only configuring you have to do before hand is inside the Movefile. The Movefile is just a file titled “Movefile” which you place inside the default WordPress directory you want to move. Using this you’ll never have to worry about renaming your site url or uploading your zipped code to a server, it takes care of everything automatically. Sass makes coding CSS fun again. It takes most of the bad things about CSS and fixes them. I won’t go into detail about how awesome SASS is, just read their site. Sass does require either Grunt or Gulp to compile it correctly, and that’s what I’ll talk about next. There’s a lot of debate as to which is better, but for this workflow I use Gulp. You can use either as preference. Both allow for the compiling of SASS into a single CSS file which is huge for a better WordPress site. We can also set it up with Livereload which really takes some pressure off my F5 keyboard button . Taking the time to setup a solid, working default WordPress theme can save a massive amount of time. In our case we started with the _s Wordpress starter theme and refactored the Sass directory to be more like this. Then we refactored the functions included to be a lot simpler. What resulted was an extremely simple starter theme that was customized for our usage. There’s really only one correct way to do this and that’s using Git. Learning Git isn’t actually as hard as a lot of people make it out to be, you only really need to know the absolute basics such as adding and committing and you can learn the rest when you need to. There are any number of awesome Git tutorials out there, and knowing it is absolutely necessary for a solid programming workflow, no matter what language you’re using. We setup a Bitbucket account for our company. Each project get’s it’s own repository and the code can easily be pulled and pushed between the 3 of us without any inconsistencies. We chose Bitbucket over Github just because of the free private repositories, though it’s really up to your preference, either will work awesomely with this workflow. Setup new default WordPress site with our default theme, and relevant plugins/settings. 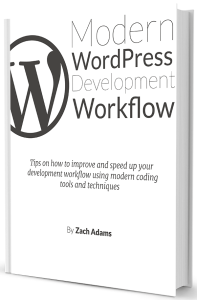 I’m writing about book about Modern WordPress Workflows! Click here to find out more! I've been looking for just this sort of workflow for the past few months with my chosen flavor of Linux! Some of the other methods I have tried either didn't work or left vital steps out of a newbie's reach. I'll be giving your method a shot this week - I cannot freaking wait! My favorite part about this is that you didn't just give a broad overview and call it a day, you actually broke down the steps for difference scenarios. To me, that's the difference between a good post and great one. Keep it up! Zach, Thanks for the awesome guide! I've managed to get the majority of your system working on my local machine, and have been able to get my files to transfer to my Digital Ocean droplet running their LAMP stack option, but I'm having trouble with the config.php file. I've created the database on my server, and the information is correct (verified by switching it out and receiving the errors for incorrect data), but it refuses to create the config.php file, or read the one that already exists within my setup.Also, my movefile is sitting in the folder above htdocs, with the vvv-init and such. Should it reside in the htdocs folder instead? Nice workflow! I have started to implement this into a couple of my projects. One question, how do you handle renaming fields in the database with the production servers ur?. In other words, changing all of the mysite.com.dev entries in the DB into mysite.com. Is this something that you do after the fact in phpmyadmin? Thanks for the help!!! First, this workflow and walk-thru are phenomenal. I've been on the hunt for the best wordpress workflow for awhile now and instantly fell in love with what you guys have came up with.However... I'm having a world of an issue with what seems to be the very last step, wordmove. Namely, the db import/pull pertaining to the siteurl and homeurl within the wp_options table.I am trying to pull a current project from a live/remote server into a new vvv local wp install.No matter what I do, on pull, everything runs great, uploads/themes/pages/posts/etc all of it, except the live url replaces my local urls within the wp_options table in my localhost db. Of course, this makes the local install useless until I manually modify those using phpmyadmin... and of course, pushing causes the same issue, but in reverse.For a few days now, I've tried modifying table prefixes, default 'wp_' prefixes, every order of operation I can think of, but all to no avail. When running: 'wordmove pull -e staging -d' or 'wordmove pull -e staging --all' everything runs great, but the staging/live url gets imported into my local environment and vice-versa on push.Did you guys run into these issues... ever? I've been hunting for days and can't seem to figure this one out. grat workflow thanks for sharing. Will be looking into the pushing/pulling/ to the production and dev servers.On another note MAMP is available for Windows now instead of just Mac. It's excellent. totally going to hijack this from you! great article. this basically covers all the crap that i deal with on a daily basis.Question - have you ran into any issues with VVV being LEMP (nginx) and whm running apache? i am using a whm/cpanel server as well, and am alittle worried about developing on nginx and then pushing to apache. This was really helpful. :) After reading this, I am trying to configure wordmove with SSH right now but it's not working. Is it possible to have a look at your movefile please?Thanks for sharing! Great article, I just have a couple questions.Having a little trouble with wordmove too. Works on everything but pulling the database files. If you have any thoughts on troubleshooting I would appreciate it.Second, how do you switch your browser between the dev, staging and production sites? hosts file editing seems awkward, slow and an opportunity to confuse the sites. hi, just few question about your workflow: 1) why pay linode to have a staging server? isn't it much easy to create a subdomain on the same live server? ex. .../www/"files-live-wp" and .../staging/"project-name"/"files-staging-wp". More easy and staging and production has the same.2) can i have much details about team coworking? each time my coworker want to change samething he has to call me? and then i have to push on my remote repository? i think that we need a way to make each coworker indipendently. isn't it? is it operable automatic synchronization beetween my local and remote repository?3) how is it possible to version controlling also the database? it would be nice if we can rollback always the database. isn't it? Thanks Zach! This post is the first time I heard of Wordmove. I will be sure to check it out. I am trying to figure out how to version control the actual VVV box separate from the sites inside. It got corrupted today and I had to destroy it then recreate it. Thank you, Zach! Looks like it's going to be a huge timesaver. I'll give this a shot. Thanks again for the great tut and follow up. Great writeup on VVV! Thanks! Especially WordMove..Do you still recommend a2 for your clients who need CPanel? They look like a decent reseller. Thanks for another informative site. Where else may just I am getting that type of information written in such an ideal method? I've a challenge that I am just now running on, and I have been at the glance out for such info. Very nice article ! I almost got the exact same workflow ! Been using Wordmove for two years and I am not looking back ! Being able to push/pull both files and database is great !